Whenever the Runner passes a rezzed piece of ice protecting this server, you may reveal and trash another copy of that ice from HQ to force the Runner to encounter the piece of ice just passed again. Grail Ice and most notibly Komainu. You see someone put an upgrade in Jinteki or the foundry after O&C comes out, and you'd better watch out! As someone who has gone to alarming lengths to get someone to run twice through a Komainu in a single run using Cell Portals and Bullfrogs and never succeeded... I'm digging out some old Jinteki decks. Why has nobody considered this in a haas bioroid foundry deck? Especially considering that it only costs 1 influence. If you can protect it with something (haas has many strong options for this, ash works, or you can use Hudson encountered twice) it could make life miserable for any fledging runner. ESPECIALLY since haas has the most archives fetching. I will be making this deck the minute I have this lovely card. I don't care whether it's tournament worthy or not. I need it! I've been testing The Twins out in a RP Tax/Kill deck. It has flatlined several times, with manageable consistency. Komainu is a nice combo piece, but keep in mind that it costs 2 credits AND you have to trash a piece of ICE. That means it is only worth it if you have a unique reason to use it. Archer costs an agenda to rez, and Komainu will have a stupid amount of subroutines. Those are two great reasons to use this. I combo it with Midway Station Grid to make it nearly impossible to break Komainu. Anyway, I really enjoy this card. Its low trash cost is fine, considering that you can just interns it back. Its also pretty cheap to rez, so that's a nice balance to ditching a piece of ICE. I haven't tried it in Foundry with Janus yet, but I'm sure that's equally as brutal. On the upside, I think this would be nuts in a Jinteki deck. 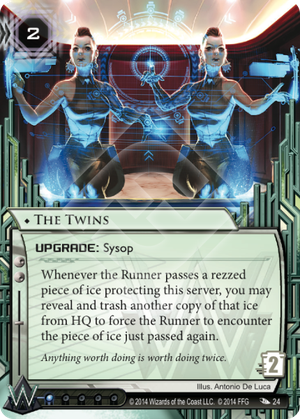 It doesn't say anything about HOW the runner passed the ice, so if they walked through a Neural Katana, it could be very bad for them if you then rez this and force a second pass. This can make any of the Bioroid ice especially click consuming for the runner. On the downside, it's an upgrade so there may be competition from other cards for its place in a deck. But that's true of many cards. It also needs you to have the ice in hand to trash. This makes the card very situational and difficult to justify, since if it is good cheap ice, you want it installed, and won't have one in hand. I think this pushes The Twins over to Blue Sun or The Foundry, especially since The Foundry will be giving you the ability to go fetch another copy of the ice just rezzed.